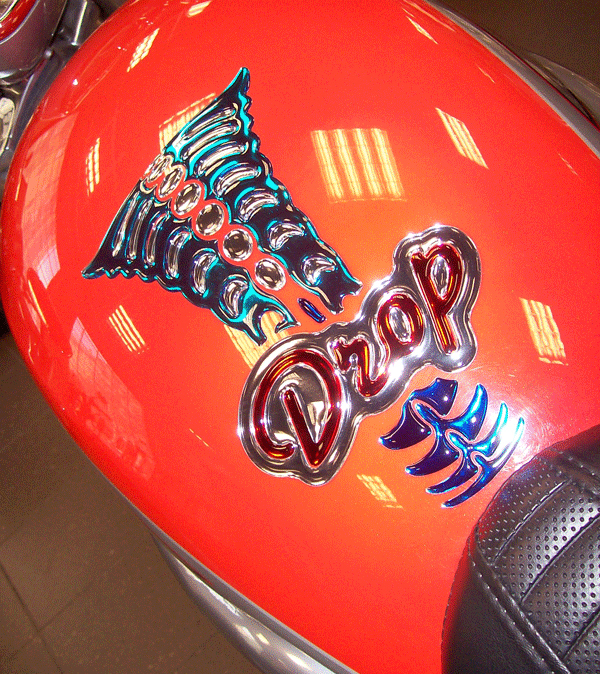 Doming of images applied to signs, nameplates, labels, badges, decals and a host of print wear and promotional products has become increasingly popular by enabling the addition of eye-catching 3D colourful effects. One of the most popular doming systems currently available is the PolyDrop from the exclusive UK distributor Graphtec GB and its network of dealers. The system uses high-quality polyurethane and epoxy resins and is supplied with a start-up kit that includes both manual and automatic feed functions, a resin dispenser and polyurethane doming resins and hardeners. The PolyDrop dispenses polyurethane resin to a wide range of substrates, including ABS, vinyl, polystyrene, polycarbonate, aluminium and acrylic as well as fabrics such as Lycra, cotton, cotton mixes and nylon. The Tex Drop application of the system uses a thermo-adhesive film on to which an image is printed, cut out and then domed with a choice of resin (including a special glitter-effect option) using an industry-standard heat press to help accelerate the doming process. Polyurethane resins are extremely flexible as well as providing a high level of resistance to the effects of solvents, abrasion and UV degradation. They are also completely safe to handle and available in different approved grades for a wide range of both interior and exterior applications in, for example, the signage, automotive, consumer electronics, marine and print wear and promotional products markets. One of the most successful users of the PolyDrop system is North Wales-based Rapid Rubber Stamps. Established in 2005 by the current owner Ron Roberts, the company started with the production of rubber stamps and engaged with sublimation and digital printing on canvas and vinyl used typically for signage, labels and stickers. The company provides a total in-house production capability embracing design, printing and now, following purchase of the PolyDrop system, 3D doming to add a brilliant finish to the products supplied to a widening customer base. For further information on Rapid Rubber Stamps, visit: www.rapidrubberstamps.co.uk or telephone 01492 596988. Do you know where I can buy the system in the USA? Thanks.